Sale. 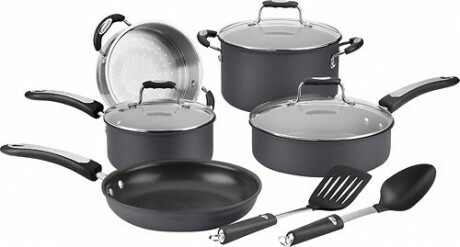 Amazon has this Cuisinart 10-piece Hard Anodized Cookware Set Sale Priced for $132.99 with Free Shipping. 10-piece set Includes a 10" skillet, 2-quart saucepan with cover, 3-quart sauté pan with cover, 5-quart stockpot with cover, steamer insert, slotted turner and universal spoon for a variety of cooking options.